The Knights Templar were keen on their saint martyrs – the upper class Roman woman Euphemia for example, butchered in the arena during the reign of the Emperor Diocletian in the early fourth century AD. Many of these saints were very strange people who died in bizarre circumstances! Diocletian was the last pagan emperor and while a brilliant administrator and largely responsible for saving the empire at a time of huge crisis, he unleashed a rather ill judged attack on Christians that backfired spectacularly within a generation. The following emperor, Constantine, converted to Christianity and Diocletian had given the faith a legion of martyrs to venerate. Saint Lucy tears her own eyes out! Euphemia was broken on the wheel then fed to a bear in the arena. The martyrdom stories of these saints are always rather lurid and test one’s credulity to the maximum. Another such martyr was Saint Lucy. According to different versions of the story she either tore out her own eyes and gave them to her husband (oh that I was making this up) or they were taken out by a Roman soldier with a fork! She if often shown, rather confusingly, with her eyes in her head but another set, the real ones I presume, on a plate. 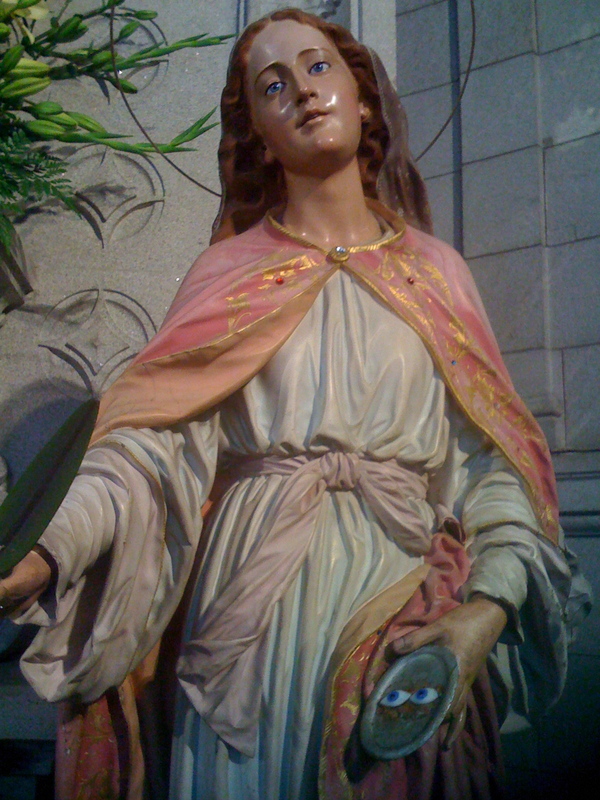 Here she is from one church I’ve visited in Europe. 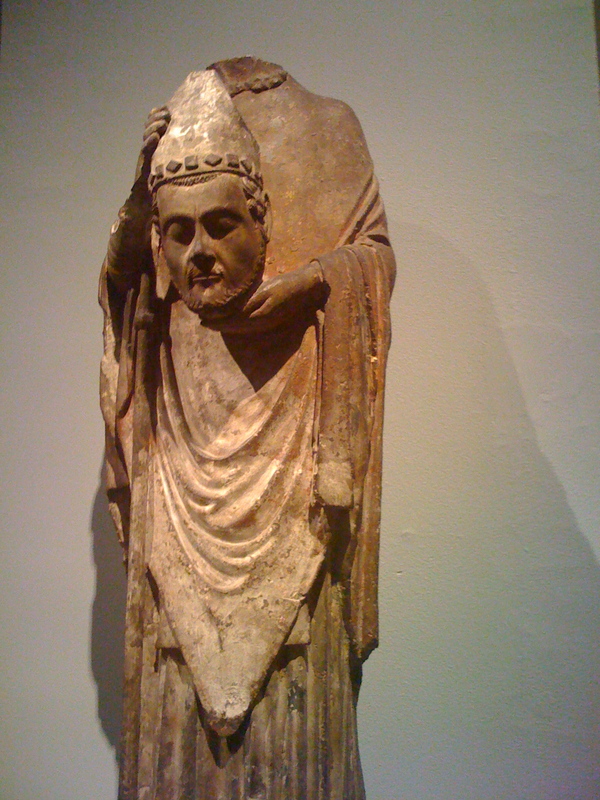 Saint Denis carrying his own head around! Another saint martyred in the Roman era and popular in the medieval era of the Templars was Saint Denis – after whom a district of Paris is named. Under the Romans, Paris was called Lutetia and in an earlier persecution, under the Emperor Decius, Saint Denis – a Christian bishop – was beheaded. True to saintly form, he picked up his head and walked round for a while before dying. Yes, this is in the story. A statue of him can be seen in the Metropolitan Museum in New York which I enjoyed visiting earlier this year. While the Templars were at the height of their power and influence in the late twelfth and early thirteenth century, Saint Francis of Assisi was founding a new order of friars – the Franciscans as they came to be known. In 1219 he went to Egypt at a time when the crusaders were attacking the city of Damietta and according to accounts from the period, hoped to be martyred. Instead, the story goes, Egypt’s Islamic rulers were so bowled over by Francis that they promised to convert at some unspecified date in the future. That I find this story impossible to believe is an understatement. 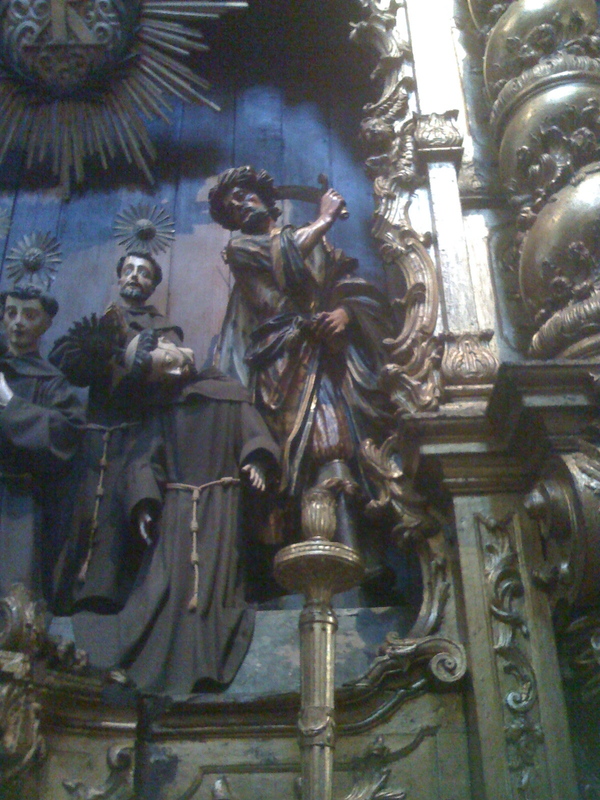 This sculpted tableau I came across in southern Europe last year in a medieval Franciscan church tells a different and more credible story. The picture says it all. Of course the daddy of all Christian martyrs and a saint hugely revered by the Templars was John the Baptist. See my earlier post on the Johnannite heresy. The man who cleared a path for the Messiah and baptised him in adulthood. 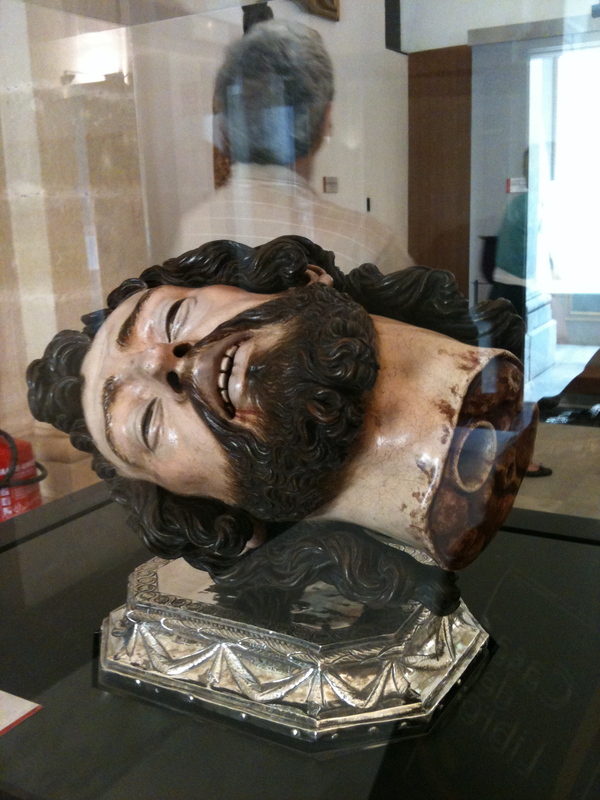 He was then beheaded and his head delivered to Salome, step-daughter of Herod, on a plate. Here he is – well his head anyway – on said plate.